Last August we broke down in some detail what I described as "the leap Schubert made" over his wonderful earlier symphonies in the introduction to the symphony we know as his Unfinished -- and let me recall that the two movements he wrote could hardly be more finished -- it's the mysteriously never-composed later movements that constitute the symphony's "unfinishedness"). As I pointed out then, most conductors churn this potentially magically mysterious introduction as if this there were nothing to it. I offerered what seems to me a truly worthy performance conducted by the longtime first violinist of the great Végh Quartet, Sándor Végh. It marks the almost 24-year-old composer's arrival at maturity as a composer of instrumental music. He also began an exceptionally lovely Andante as a second movement, but abandoned it after 41 bars. [We're going to hear that in the click-through.] There seems to have been a private performance in 1821, though no public one until 1867, more than 38 years after Schubert's death. The "Quartettsatz" is fiery and lyric, both qualities in excelsis, a bold exploration of the possibilities of tragic expression and and an exciting promissory note in Schubert's catalogue. The Quartettsatz is played by the Avalon Quartet (Blaise Magniere and Marie Wang, violins; Anthony Devroye, viola; Cheng-Hou Lee, cello). BEFORE -- REMEMBER THE CANDIDE OVERTURE? 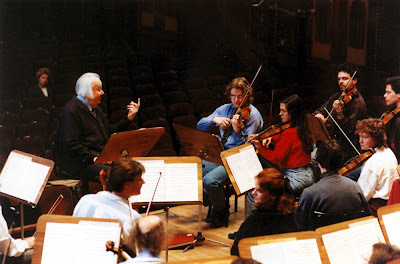 Lenny B conducts the Overture to launch the famous December 1989 London concert performance of Candide. FOR ENCORES SCORE HIGH IN "GRABBINESS"? I've talked about this before -- in connection, for example, with Leonard Bernstein's Candide Overture. Perhaps it's not surprising that compulsive listener-grabbiness is a frequent quality of pieces favored by performers for use as encores. Aas I indicated last night, perhaps the ultimate expression for me is the Polka from Shostakovich's score for The Age of Gold, of which the composer made arrangements for both solo piano and string quartet. By way of refresher, here's the string-quartet arrangement a couple of more times along with the orchestral original. First let's listen to it along with that "lovely Andante" Michael Steinberg told us Schubert began as a second movement -- and mysteriously abandoned after 41 bars. Borodin's "Notturno" is played by four talented young Turks -- according to the YouTube poster, violinists Deniz Türeli and Özge Tanriver, violist Aydal Sargutan Isgören, and cellist Özlem Gürsoy are all members of the Antalya Symphony Orchestra, "around" their late 20s and early 30s. Now back to our program of four Russian quartet "encores." We've heard the Andante cantabile, both in Fritz Kreisler's celebrated violin-and-piano arrangement and in the original version. I don't know that it's necessary to say anything more about this gorgeous piece. Maybe it's just me, but I haven't encountered the Glazunov Novelettes much. 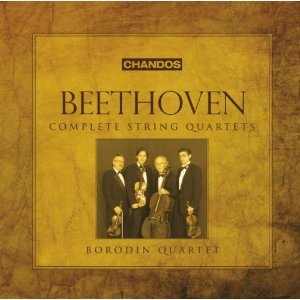 The "Valse" is the obvious charmer, and is performed as a free-standing encore on the Borodin Quartet CD. 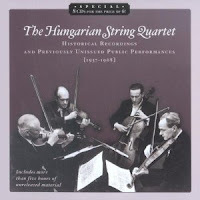 But the whole set strikes me as utterly delectable in the complete recording by the Hungarian Quartet, which we'll have to hear in its entirety one of these days. 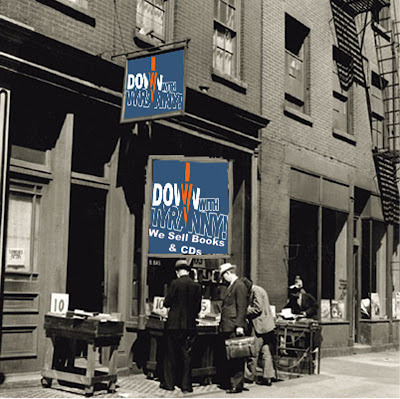 It comes to us courtesy of an outstanding eight-CD Music & Arts set devoted to the Hungarian. It's mostly previously unissued broadcast performances, but also includes most of the infectiously animated recordings the group made for the budget Concert Hall Society label c1952-53 -- essentially live performances, since they were basically recorded in straight-through single takes. Our friend Philip Munger anticipated this selection with his comment on last night's post: "I'll be conducting the Notturno from Borodin's 2nd String Quartet in its string orchestra transcription in Anchorage on May 14th, as part of a Russian pops concert by the Anchorage Civic Orchestra. That is one lovely little gem. Like the ["Haydn"] Serenade, a simple, straightforward breath of beauty. If we have any readers within striking distance of Anchorage, I hope you'll attend Philip's concert and say hello to him for us. After many years of listening compulsively to Shostakovich's string-quartet arrangement of his Polka from The Age of Gold, I've more or less forcibly listened quite a number of times to its companion, the "Elegy" arranged from Katerina's aria from the opera Lady Macbeth of the Mtsensk District, and I've come around to the view that it is indeed a hauntingly beautiful piece. But then there's that amazing Polka. 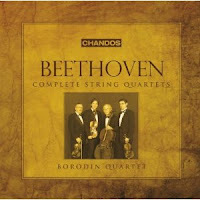 Now here's an assortment of performances of the string-quartet arrangement. Oh yes, we have just one more string-quartet encore-type piece, one with which I also have a particularly obsessive history. The Kufchak Strings play Gershwin's Lullaby. Of the encore piece from those St. Petersburg Quartet CDs which got me started on the subject, the non-Russian one is an uncredited quartet arrangement of "Golliwog's Cake-walk" from Debussy's Children's Corner suite, written originally for piano solo. I thought it might be fun to hear the piano original as well as the violin-and-piano arrangement by Jascha Heifetz. This lovely little Puccini piece has become a popular quartet encore piece. 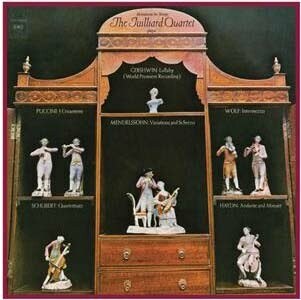 Our first performance is from the same Juilliard LP as the Gershwin Lullaby. The second is by the outstanding Czech Kocian Quartet. Although the Barber Adagio is better known in the arrangement the composer subsequently made for string orchestra, and especially since Platoon we seem to hear it everywhere, the string-quartet original gets its share of play. We're going to hear it both ways. While I was mucking with the Juilliard "Minatures for Strings" LP, I made one additional sound file, not knowing whether I would wind up using it. I didn't, but it seems a shame to let it go to waste. It's the great song composer Hugo Wolf in an unaccustomedly flowing, lyrical frame of mind. More string-quartet encore-type pieces, this time all Russian.